The subject matter for this “Ticket of Leave” is superstitions and ‘folk magic’ of the early Australian colonial settlements — a topic suggested by one of our readers (based on some interesting news articles about recent discoveries shedding light on the beliefs of early colonists). It is a fertile area to explore for a Lovecraftian setting: HPL himself was not above taking folk traditions of colonial America (in particular beliefs in witchcraft) and riffing on them to create some new Mythos-fuelled horrors. The superstitions of early Australia, while they share similar roots, have their own quirks and idiosyncrasies which lend a different flavour. As well as providing some general notes on superstitions and “good luck” practices of colonists, this supplement also includes a full-length scenario (or mini-campaign outline, really) based on the curious phenomenon of concealed objects. There is a growing body of historical evidence to suggest that it was not uncommon practice for early colonists to embed mundane objects into the walls of homes during their construction as a kind of protective ward. In some cases these were simple charms written on paper, or common objects like boots. In other cases these were more outlandish, like the practice of embedding a dead cat in the wall to symbolically “chase away” any stray malign spirits that might try to enter. 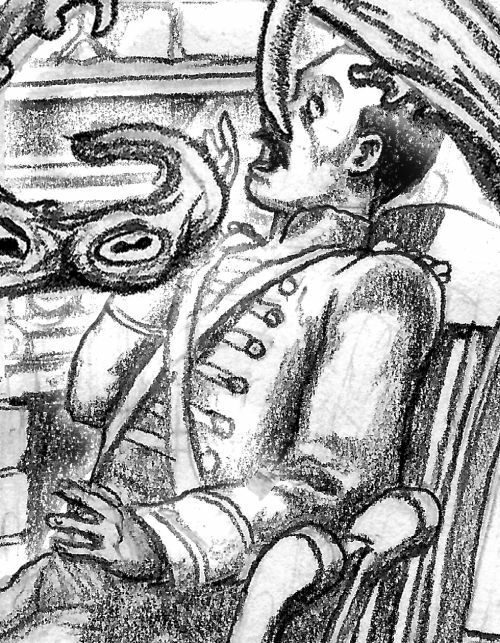 Of course in the context of Cthulhu Mythos horrors, the notion of things being concealed in the walls of the family home lends itself to more destructive and terrifying possibilities, as explored by the scenario “The Thirteenth Convict.” Investigators are summoned to the site of a farmhouse in a remote corner of the colony, where death and calamity seems to have visited in the form of a great force that seems to have burst forth from within the wall. A few days later, a remarkably similar incident destroys a second farmstead — in a far-distant settled region. What, if anything, do these strange calamities have to do with the odd, black-robed Frenchman who has recently arrived in Sydney? And why has the itinerant minister who tends to the spiritual needs of both settlers and convicts in these remote localities mysteriously disappeared? Unless the investigators can get to the bottom of these unprecedented happenings, the number of those killed or sent mad will surely soar … and as disasters multiply, a cruel plot to sow discord through the forces of Outer Gods begins to unfold. Who is the Thirteenth Convict and why does his (or her) future matter so much to the shadowy forces casting terror across all corners of colonial New South Wales? 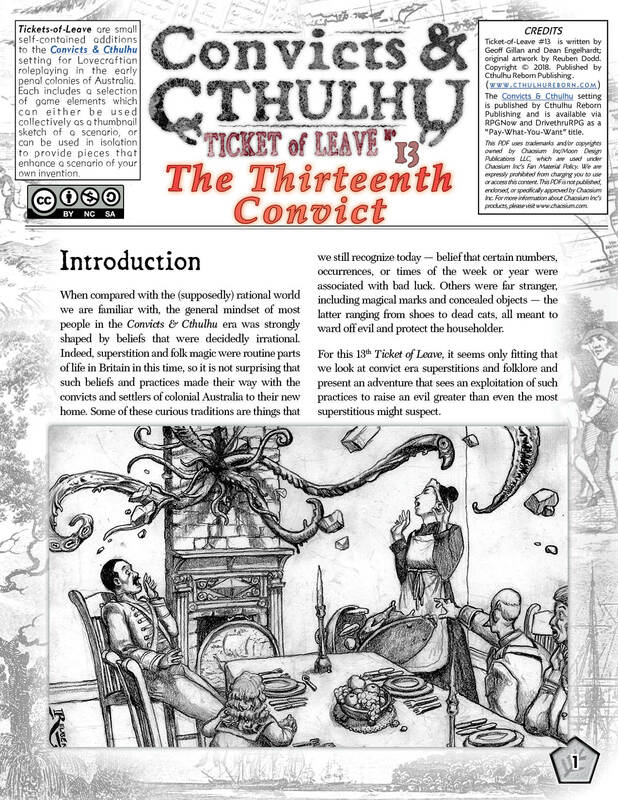 Ticket of Leave #13: The Thirteenth Convict is available right now as a free 27-page PDF download. The version linked here is complete with game statistics for the Call of Cthulhu, 7th Edition (under Chaosium’s fan license). As with other recent releases, we have been obliged by fine print in Chaosium’s license to also create a stat-free version of the supplement for distribution via RPGNow and DrivethruRPG. That version will go on-sale as a “Pay-What-You-Want” title in a day or so. We trust that this supplement about all things superstitious will bring you and your gaming group good fortune as you plumb the dark depths of the worst that the Cthulhu Mythos can throw at humanity (that insignificant upstart species!). If you love this free download so much that you feel offended by the fact that you haven’t paid money for it (and yes, believe it or not people have said that us) … you can always head over to our brand new “donations” page. There’s no obligation, though — honestly, we’re thankful for the continued support we receive from our loyal readership that downloads (and plays!) our gaming supplements. Long may the cruel tyranny of Convicts & Cthulhu flourish, and the sharing horror just helps is spread! This entry was posted on Monday, October 8th, 2018 at 1:14 am	and posted in Convicts & Cthulhu, Scenario Downloads. You can follow any responses to this entry through the RSS 2.0 feed. Enter your email address to follow Cthulhu Reborn and receive notifications of new posts by email. Exit the Dateline; Enter the Zombies!